Everyone knows foot odor can be the most difficult odor to control on a personal level but is critical from a hunting perspective. X Scent has the only real answer to foot odor while hunting and the best thing about it is that the power to control the odor is sewn right into the sock fabric and can't wear or wash out. X Scent Socks control scent by eliminating it before it grows. 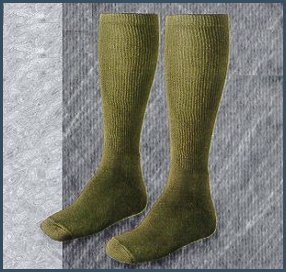 X Scent Boot Socks have been proven effective by the U.S. military and are used by U.S. soldiers all over the world to protect their feet for days under all conditions and environments. Fabric is 95% Cotton, 5% X STATIC. Available sizes are 13" Crew or 18" Calf. Men's Shoe Sizes are M 5-9, L 10-12, XL 12 1/2-14.